The modern lifestyle has made various health risks such as hypertension, heart disease, and other common cardiovascular conditions increasingly common. Picking the right sphygmomanometer is a smart choice that we should all consider daily, for the good of our healthy bodies. The first blood pressure measurement was recorded in the year 1733, and the first sphygmomanometer was invented in the year 1881 by Samuel Siegfried Karl Ritter von Basch. The pioneering design consisted of two parts–a rubber bulb filled with water, and a mercury column. The water in the rubber bulb was used to restrict the blood flow in the artery, while the mercury column was connected to the bulb that translated the pressure required to obscure the pulse into millimeters of mercury completely. In 1896, Scipione Riva-Rocci made further improvements in Ritter’s first sphygmomanometer. He added a handcuff that could be fixed around the arm to apply pressure on the limb, to measure the blood pressure. This design became the standard for such devices later on. In 1905, Dr. Nikolai Korotkoff discovered the difference between systolic blood pressure and diastolic blood pressure. This discovery laid the foundation for modern blood pressure measurement as we know it today. Simply put, when pressure is applied and released, they are accompanied by the appearance or disappearance of sounds within the arteries. These systolic and diastolic sounds are thus used as standards in blood pressure measurement and are known as Korotkoff sounds. The sphygmomanometer apparatus has since then evolved greatly to the available technology offered today, now more commonly known as the BP apparatus. Advancements in the sphygmomanometer, or blood pressure gauges as they are also often called, have been quite impressive over the years. Medical devices have become more specialized, and various types of sphygmomanometers have become available in the market. Outlined in our list below are three major types of sphygmomanometers–mercury, aneroid, and digital. The mercury sphygmomanometer is the most conventional form of blood pressure apparatus, and it can be considered the golden standard in the health industry. Mercury sphygmomanometers are made up of manually inflatable cuffs that are attached to measuring units with mercury-infused tubes. While operating the device, it is important to place the apparatus on a flat surface and in an upright position to get the correct readings. These devices are very delicate and require special care, and if accidentally dropped can cause rupture of mercury, rendering the device useless and potentially hazardous. The biggest advantage of using mercury sphygmomanometers is that they are quite easy to use, and if used properly, can last a lifetime. The device can produce the most accurate results without requiring much readjustment. Due to the toxic nature of its contents, however, the use of mercury sphygmomanometers have been banned in some countries, and other forms of sphygmomanometers are being used instead. Aneroid means “without fluid,” and as the name suggests, this type of BP apparatus doesn’t make use of any mercury and is therefore considered the safest alternative to mercury sphygmomanometers. Its recording procedures are pretty similar to that of the mercury sphygmomanometer, except the stethoscope’s attachment to the cuff. In the aneroid device, the cuff is attached to a dial gauge with tubing. The gauge head contains mechanical parts that convert the cuff pressure into gauge-based reading. Additionally, there are various other types of aneroid sphygmomanometers depending on how they are used. These include pocket-aneroid sphygmomanometers, palm aneroid sphygmomanometers, and clock-style aneroid sphygmomanometers. Ultimately, the benefit of using aneroid sphygmomanometers is the affordability of the apparatus, as well as its compact and handy nature. However, similar to other devices used to measure blood pressure, aneroid sphygmomanometers make use of a delicate mechanism and therefore necessitates careful handling. Aneroid sphygmomanometers also require recalibration by experts, to avoid cases of faulty reading. The automatic digital sphygmomanometer is the most technologically-advanced sphygmomanometer design to date. These devices use an electronic pressure sensor to measure the blood pressure, and the readings are presented on a digital display. Similar to mercury and aneroid sphygmomanometers, digital sphygmomanometers also come with inflatable cuffs, but there is a difference in the procedure for measuring blood pressure. Unlike the other two types, automatic digital sphygmomanometers evaluate and measure the fluctuations of arteries. These devices are perfect for home use as they are easiest to operate. To avoid the risk of inaccurate readings, periodic counter checks with conventional mercury sphygmomanometers are recommended. In making use of sphygmomanometers, procedures vary according to the type and variety of sphygmomanometer used, but all varieties operate on a single principle. A bulb increases the pressure by inflating the cuff placed around one’s arm, and a valve releases the pressure. During this process, a stethoscope is used to listen to arterial blood flow sounds. As the heart beats, blood going through the arteries causes a rise in pressure, which quickly decreases when the heart’s ventricles prepare for another beat. This rise and fall are called systolic and diastolic pressure, respectively. Below are the steps to accurately measure one’s blood pressure. Know your basic knowledge of blood pressure readings. Blood pressure readings are expressed as systolic over diastolic pressure. The normal blood pressure of an average healthy adult is 120/80. Use proper-sized cuffs. Cuffs that are too loose or too tight may influence the accuracy of blood pressure measurements. The cuff should be 80% of the circumference of the upper arm. Be sure not to place the cuff on a clothed arm. Properly place the cuff on the arm. While wrapping the cuff around the upper arm, keep the lower edge of the cuff one inch above the antecubital fossa, the region of the arm in front of the elbow. Position the stethoscope. Lightly press the stethoscope bell over the brachial artery, just below the lower edge of the cuff. Inflate the cuff. Using the bulb, inflate the cuff to 180 mmHg, then release using the valve at a moderate rate of about 3 mm per second. Listen and observe. While examining the dial or mercury gauge, listen for a knocking sound with the stethoscope. The first knocking sound represents the systolic blood pressure of the patient. The point when the sound disappears meanwhile signifies the diastolic pressure. Repeat the procedure on the other arm. For accurate analysis, it is recommended that the blood pressure of both arms are measured. The difference in measurement of both arms, as well as the patient’s position and cuff size, must be noted. Monitoring one’s blood pressure is a responsibility not just of doctors and physicians, but of every individual alike. Having abnormal blood pressure levels, whether elevated or dropped, are sure warning signs of ill health, and checking for these abnormalities is an important step towards prevention of hypertension, stroke, or heart attack. Therefore, households as much as clinics and hospitals should invest in good quality sphygmomanometers for frequent use. Below is a list of the relevant factors one should consider before choosing what sphygmomanometer to purchase. The right sphygmomanometer is determined by the needs and requirements of its user. Aneroid sphygmomanometers provide readings of high accuracy but require sufficient knowledge and expertise of handling the device. Nurses, physicians, and specialists should, therefore, look for durable, flexible, and high-accuracy devices such as these, that can withstand heavy use. Individuals looking to buy sphygmomanometers for personal use, meanwhile, may consider purchasing sphygmomanometers that are easiest to operate among the many varieties. Digital sphygmomanometers are designed to be very user-friendly, especially for those who do not have any medical background. Price is another determining factor for what sphygmomanometer to purchase, and the allocated budget can highly narrow down one’s decision. The price range of a decent sphygmomanometer varies from 10 to 70 dollars, depending on the type. Devices that fall in the higher price ranges are those designed for specialists who require high-performing instruments. As with any medical instrument, the accuracy of measurements is of utmost importance. As discussed earlier, the accuracy of sphygmomanometers largely depends on its type–mercury sphygmomanometers provide the standard of measurements and is therefore of highest accuracy; aneroid sphygmomanometers also provide readings of very high accuracy, but require a sufficient knowledge and expertise of handling the device; digital sphygmomanometers tend to sacrifice convenience and ease of use for accuracy of measurements, compared to the other two sphygmomanometer types. Sphygmomanometers vary according to their quality of material and design, all of which affect the overall performance of the device. Therefore, all parts of a sphygmomanometer should be of top-notch quality. The cuff material, gauge, inflation bulb and valve should all ideally be well constructed, non-sticking and hypoallergenic. An ideal gauge should have 300 mmHg of pressure, and the bulb part should be made out of latex-free material. For a sphygmomanometer, cuff size is also extremely important. Cuff sizes that are either to too loose- or tight-fit might result in incorrect readings. Therefore, one must make sure that the width of the sphygmomanometer cuff provides a size range that can fit its user perfectly, whether for personal or clinical use. For reference, 80% of the arm should be covered by the air bladder of the cuff. Small cuff sizes are for arm diameters of 17 to 22 cm, medium cuff sizes are for 22 to 32 cm, and large cuff sizes are for 33 to 42 cm arm diameters. For medical professionals, it is advised to purchase a medium sized cuff that can be adjusted to fit patients’ larger and smaller sizes. Sphygmomanometers, whether used frequently and in different places or bought for home use, should be evaluated based on convenience and ease of use. Physicians who need an instrument that can keep up with the busy work schedules that bring them to different places should purchase a sphygmomanometer that is lightweight and easy to carry. Those who are looking to buy a sphygmomanometer specifically for home use can opt to save a few bucks and choose a device that does not need to be lightweight or pocket-sized. The White Coat Deluxe Aneroid Sphygmomanometer is designed for medical professionals and professionals-in-training. Aneroid sphygmomanometers provide a quick and easy technique for acquiring blood pressure readings among patients. Because it is relatively cheap and easy to use, this product is also perfect for medical students. Available under 20 dollars, this product provides a compromise between quality and affordability. Additionally, the product package also includes a LED penlight and pupil gauge, making it an even more valuable deal. Aneroid sphygmomanometers are generally considered high accuracy instruments, as long as a proper protocol is followed for its maintenance. As an alternative to mercury sphygmomanometers, aneroid devices are the top choice. The instrument is made of high-quality aluminum alloy and is considered DEHP-free. The cuff is made of nylon, and the air release valve is large and of a taper-end design for easier manipulation. The purchase also comes with a LED penlight and a pupil gauge for other medical check-up processes. The nylon cuff comes in an adjustable adult-sized cuff, so its fit might be limited. The White Coat Deluxe Aneroid Sphygmomanometer is an instrument that can be used on-the-go. Because of its lightweight nature, the instrument can easily be brought anywhere in its black carrying case. The instrument is a recommended purchase for doctors, nurses, and medical students looking for a sphygmomanometer that they can bring anywhere, around hospitals, and on-the-go, but also one that they can rely on to give accurate readings at a relatively low price. •FREE MDF Single Head Stethoscope (MDF72710) with your MDF Sphygmomanometer purchase. ``Add Both To Cart`` (discount applied at checkout). See details in Special Offers section below. TRUSTED by Medical Providers since 1971 | Backed by our New Full Lifetime Warranty & Free-Parts-For-Life | Latex-Free | Adult Sized Cuff Included GAUGE: easy to read, extra-large high-contrast dial, stress-tested over 3,000 times, calibrated five times and certified 300 mmHg manometer attains accuracy of +/- 3 mmHg without pin stop. CUFF and CARRYING CASE: adult-sized cuff, high-molecular polymer nylon cuff and carrying case are abrasion and moisture resistant. Accurate arterial compression with artery indicator label and index range. Removable bladder for easy cuff cleaning. INFLATION: high-density non-stick, non-cracking inflation bulb and bladder. Equipped with screw-type valve for easy and precise deflation control. MDF Calibra Aneroid Sphygmomanometer is considered the best product available on the market right now. A quality product made for professionals, the instrument requires some assembling upon purchase. 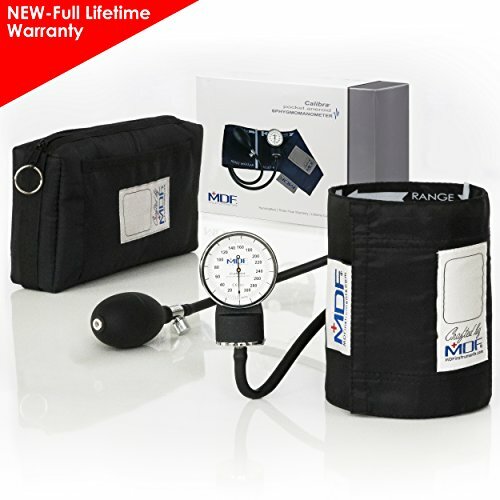 The MDF Calibra Aneroid Sphygmomanometer costs around 30 dollars, and with this relatively low price, the device comes with 3 years warranty and a lifetime offer of calibration. The MDF Calibra offers a top-quality inflation bladder and bulb made of safe, latex-free material. It has a large high-contrast gauge that provides uncomplicated readings, as well as an artery indicator lab, index range and a very comfortable cuff made of high-molecular polymer nylon. Its high-density inflation bulb and bladder come with a chrome-plated brass screw valve. The MDF Calibra’s most distinctive feature is that it is a hand-crafted product. The instrument also comes with an adult-sized cuff stress-tested 3,000 times and calibrated five times. It is a portable device that you can easily carry around with you. The carrying case included in the purchase, along with the whole instrument, is also resistant to abrasion and moisture, which makes for a high-quality instrument that can withstand frequent use and wear-and-tear. The MDF Calibra is a well-tested brand that offers accuracy and quality sphygmomanometer parts at a relatively inexpensive cost. 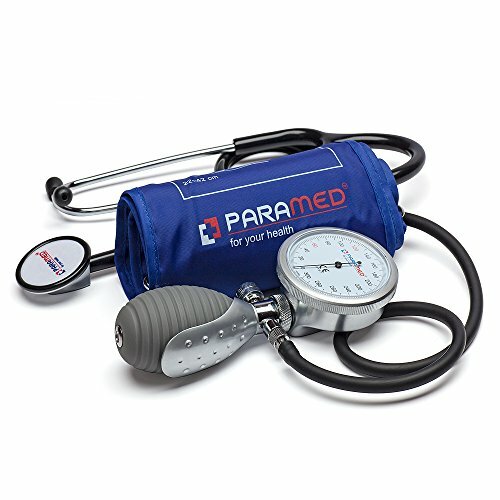 The flexibility of this sphygmomanometer design makes it a perfect tool for doctors, nurses, and other medical professionals, as well as medical students learning the techniques of the field. Made for both clinical use and at-home health monitoring, the Balance Sphygmomanometer offers a quality instrument at an affordable price of under 25 dollars. The aesthetically-designed product also comes with 2-year warranty. Aneroid sphygmomanometers are generally considered high accuracy instruments, as long as a proper protocol is followed for its maintenance. As an alternative to mercury sphygmomanometers, aneroid devices are the top choice. The Balance Sphygmomanometer has been deemed accurate within 3 mmHg. One of the best features of the Balance Sphygmomanometer is its streamlined design, combining the bulb, dial, and air valve in one complete component for easier handling and use. The dial and overall color scheme were also updated to become easier on the eyes, and the healthy range for blood pressure readings on the dial was emphasized for quicker visual analysis. In addition, the cuff is lined with soft fabric and adjustable for adult arm sizes of 8.75 to 16.5 inches. The cuff also comes with an artery indicator and D-ring for a more convenient fitting process on the arm. The Balance Sphygmomanometer succeeds in making an easy-to-use device with its combined components of bulb, dial, and air valve. This design makes it easier to take blood pressure readings of one’s own body. It also comes with a storage case for easy carry, and the overall structural design makes for a less cluttered instrument, making it easy to bring it around and whip it out for quick blood pressure measurements at home, at the clinic, our out in the field. The Balance Sphygmomanometer is a great instrument for anybody with a need to take blood pressure readings. Its aesthetic, easy-to-use and easy-to-read design, along with reliable and highly-accurate measurements makes it a great bargain. The instruments simplify blood pressure measurement in any context. The Paramed Aneroid Sphygmomanometer is a premium quality instrument perfect for home use. 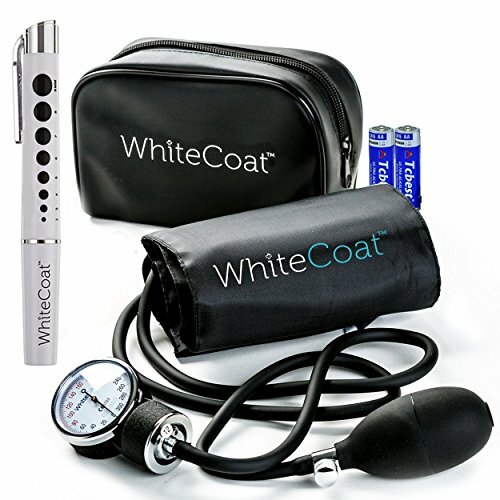 It is available for around 30 dollars, stethoscope and carrying case included, making it the ultimate purchase for those dealing with hypertensive symptoms and would like to monitor their health without the frequent need for doctor visits. Given its accuracy, the Paramed Aneroid Sphygmomanometer can also be a great tool for doctors, nurses, and other medical practitioners. The Paramed Aneroid Sphygmomanometer is made out of premium quality material which consists of super sensitive polymer remembrances and hypoallergenic PVC tubes. Because of its design, the instrument is easy to use for both left and right-handed people with a simple flip of the dial. Similar to other sphygmomanometer designs, the Paramed Sphygmomanometer also combines the bulb, dial, and valve in a single handful for easy manipulation and self-examination. It has a long, comfortable, wear-proof nylon cuff of 22 to 42 cm fitted with a comfortable velcro strip. This purchase includes a complete blood pressure kit, with the manual cuff and a single head stethoscope. This Sphygmomanometer by Paramed is an excellent gadget for every home. It can track your blood pressure easily and accurately, anywhere at any time. It is a lightweight, portable device. This sphygmomanometer type is perfect for home and personal use, because of its simplicity and high accuracy measurements. The best feature of the Paramed sphygmomanometer is the convenient manual manipulation through the combined bulb, dial, and valve, and alterable orientations for both left-handed and right-handed individuals. Automatically inflates when wrist is at heart level and indicator lights make it easier to find the correct position. Silent and quick inflation, so measurements can be taken quietly anywhere, anytime and even more discretely. Blood pressure level bar shows how your reading compares to the internationally recognized guidelines for normal blood pressure levels. Slim design is discreet, convenient and portable so you can take measurements when you need to. Irregular heartbeat detector detects and alerts you of irregular heartbeats while your blood pressure is being measured. Advanced Averaging technology displays the average of the last three readings in 10 minutes. 100 Memory storage with date and time stamp allows you to review the last 100 readings with a touch of a button. Fits wrists sized 5 1/4`` to 8 1/2`` in circumference. Digital sphygmomanometers have become quite popular, not only for personal use at home but also in hospitals. A number of high-quality sphygmomanometers are available in the market, but among these, Omron 7 series is considered the best. Aside from the blood pressure measurement through the wrist, there are also a number of other useful features including a hypertension indicator, irregular heartbeat indicator, advanced averaging technology, blood pressure level bar, and digital data storage with date and time stamps. Digital devices are sold at higher price ranges because of the convenience they offer, but for Omron 6 series at around 50 dollars, it is sure to be a successful compromise. Out of the three sphygmomanometer types, the digital sphygmomanometer offers the least accuracy, but still of an arguable clinical standard. Even so, the Omron 7 Series is the most recommended brand by doctors and pharmacists for clinically-accurate home blood pressure monitoring. When worn, its Heart Zone Guidance program allows for consistently accurate readings by measuring blood pressure each time the arm is at heart level. From quality and design standpoint, it is a great device that is quite easy to use. It stores and reviews the last 100 readings with date and time stamp. It is a durable and long-lasting product, excellent for use at home. The Omron 7 Series It is a highly recommended product for home use, and it comes with a comfortably-designed cuff fitted onto one’s wrist, that one can adjust according to your own requirement. In addition, the instrument is equipped with ultra-silent inflation capabilities so that one can use the device in any setting without too much noise and hassle. The Omron 7 Series is a portable device that patients and users can wear anywhere. It has a sensor that is automatically activated whenever the wrist is raised at heart level, while a blue light gives an alert notification before it takes the reading. The instrument has many value-added features, and it is overall a great product for personal use at home and even outdoors, due to its battery-powered design. 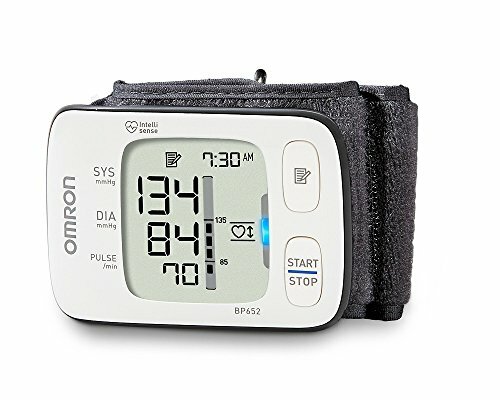 For normal individuals who would like the convenience of measuring blood pressure readings virtually anytime and anywhere, the Omron 7 Series is a perfect choice. Recommended by doctors and other healthcare practitioners, it is an easy to use gadget that provides clinical-level accuracy. This design addresses the need for effective and convenient health monitoring at home. If you are looking for a digital sphygmomanometer with a manual pressure cuff, then Balance Professional Upper Arm BP Monitor is the best go-to option for you. Digital sphygmomanometers are of more expensive price ranges than other sphygmomanometer types, but the Balance Professional Pressure Monitor is available at a very reasonable price. The highly-technological device can measure systolic and diastolic blood pressure, as well as pulse, with a single push of the button. Since it is a digital device, it may not be as long-lasting as aneroid sphygmomanometers, but its purchase comes with a two-year warranty. Out of the three sphygmomanometer types, the digital sphygmomanometer offers the least accuracy, but still of an arguable clinical standard. However, the Balance Upper Arm Blood Pressure Monitor still succeeds in offering highly accurate readings in the home context. 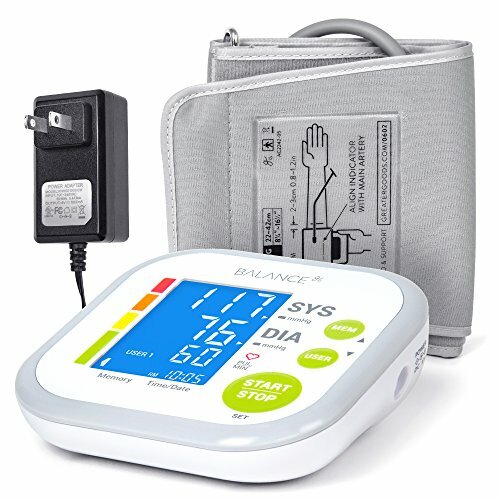 The Balance Professional Upper Arm Blood Pressure Monitor is one of the most sought-after premium digital sphygmomanometers available in the market. It has a simple and easily adjustable upper arm cuff. It is a one-size-fits-most cuff, which means you can adjust to any arm size. The readings will display on the screen when you push the button, and 2 users can store up to 60 records each. Another great feature of this device is that it automatically switches off, providing battery-saving qualities. Like most digital sphygmomanometers, the Balance Upper Arm Blood Pressure Monitor is a portable and easy-to-carry device. The product comes with two power sources–power cord and AAA batteries. The kit includes a case for convenient storage. With its large LCD and buttons that are easy to navigate, the Balance Professional Upper Arm Blood Pressure Monitor is perfect for home use. It is recommended for households to have a reliable blood pressure instrument at home, for regular use and emergencies. A sphygmomanometer is an extremely important medical apparatus used for monitoring and evaluating an individual’s blood pressure and overall health. Therefore, it should give quick and accurate readings every time. The market is filled with all types of sphygmomanometers with different designs, types, prices, and brands, making it difficult to select the right one. Our sphygmomanometer buying guide provides you all the required information to choose the best sphygmomanometer for you, whatever you might use it for. The sphygmomanometers mentioned in our list are some of the best devices available in the market.